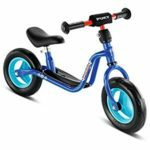 Find the Best Balance Bike For You! Balance bikes are a great way to learn to ride a bike, and with spring and summer upon us this is the perfect time to explore on two wheels! Balance bikes allow children to learn the principles of balance, steering and braking without having to worry about pedalling at the same time. This means that when they graduate to a proper pedal bike, it will be much easier for them to learn to pedal as balancing and steering will be second nature. There are a huge range of balance bikes available for all ages from toddlers as young as 18 months all the way through to balance bike experts as old as 11 or 12. There are even some adult balance bikes as well now! Children at different ages have different requirement, so we have prepared a guide for the best balance bike for each age range as well as plenty of hints and tips on how to get the most out of your child’s time on two wheels. To get started, we have put together the Ultimate Balance Bike Guide below, which includes our 7 favourite models for 2019. The at-a-glance guide includes important factors such as the suggested model, most suitable age range, weight, price and the all-important saddle height! If you are in your late 20’s or 30’s and bringing up your first child, then the chances are that you may not have heard of balance bikes before you started doing your research and came across this website! Back in the 80’s and 90’s, it was a rite of passage for children to learn to ride on traditional bikes with stabilisers or training wheels – cycling around the park under the encouragement of Mum and Dad before the big day when the wheels were removed and you wobbled off triumphantly down the road. However, although this method helps children learn to steer and brake, studies have shown that because the stabilisers provided a safety net to stop the bike from toppling over then children did not learn to balance and as soon as the wheels were removed a crash was almost inevitable. The modern day balance bike was designed to solve this problem, and it is a simple design as a normal bicycle but without pedals, a chain or stabilisers. The child should be able to sit comfortably on the saddle and be able to walk the bike to learn to turn, glide, stop and start with their feet flat on the floor. Check out our balance bike seat height guide for more information on how to measure your child and match the best balance bike for them. This teaches the child how to balance on the bike, and it won’t be long before they build enough confidence to control the bike through turns and manoeuvres that is not possible with a traditional bike fitted with stabilisers. Balance bikes are lightweight, easy to transport and have revolutionised the way that children learn to ride bicycles. They are also clean, easy to maintain and provides hours of fun and entertainment. They also provide a great excuse for all of the family to get out and do some exercise. 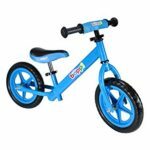 The comparison table above should provide a good starting point for you to compare the main features of some of the more popular balance bikes. This is probably the most important thing to consider, as no matter how stylish or sleek your balance bike – your child will simply refuse to use it if they cannot sit comfortably on the seat. Your main choice will be between a metal balance bike or one with a wooden frame. Metal bikes are probably more popular, as they look sportier and more like a real bike. However, there are some great wooden bikes that we recommend such as those from Early Rider and Kiddimoto. 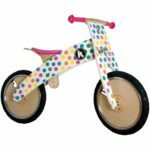 Wooden balance bikes can also be painted in fun designs which makes them very popular. 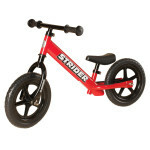 Most balance bikes have air tyres, although some manufacturer such as Strider have opted for EVA foam tyres. Air tyres will generally give a more comfortable ride on pavements and across fields, but EVA foam tyres are puncture proof and easy to maintain. Although some balance bikes are fitted with brakes, this feature is only really necessary on bikes for children aged 4 and above. Younger children should focus on balancing and they may lack the co-ordination to operate a brake properly. Other features of a good balance bike will include safety handlebars, a comfortable padded seat and of course a funky or sporty design so the bike looks good in the park. 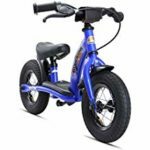 Every child will have varying requirements when you are looking for the best balance bike, so a 2 year old just starting out will need a very different bike to a 5 year old on the latest and sportiest model. 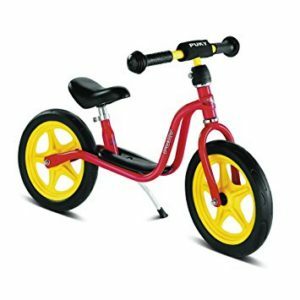 This is the perfect age to start learning to ride a balance bike, so there is a great choice of models available. Some models have a low platform for the child to rest their feet, or a step through frame which makes it easier to mount the bike. The best examples of these are the Puky Learner bike and the Bike Star balance bike, both of which offer the low platform. If you prefer a step through frame, then the Weeride Starter bike is a good option. A low saddle height is also a must for this age group, and saddle heights tend to start at around 29cm. A wide range of models will now open up, with children much more confident on their feet and possessing more stamina for a longer bike ride. There is a huge range of models available for 3 year olds, and once again the most crucial factor is the saddle height as a 3 year old will be too big for some of the smaller models. Get the choice right at this age and there will be no stopping them. Bikes for 4 year olds will be larger and heavier, and almost all models will resemble proper bikes rather than toys. Abilities will vary as some children may have practised for 2 years whereas others will just be starting. We would recommend balance bikes with 12” or 14” wheels for this age, and there are several good quality models available. Some children do not discover balance bikes until 5 or 6, while others may love balance bikes so much they want to continue riding! Strider are probably the market leaders in balance bike for older children, and there are even national competitions arranged for kids to show off their tricks! 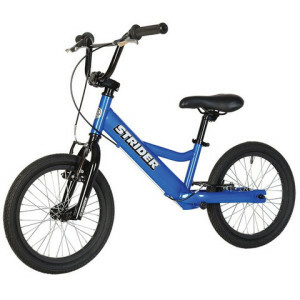 Although there are fewer models available for this age group, there are still some excellent options such as the Strider Youth balance bike or the Go Glider balance bike. 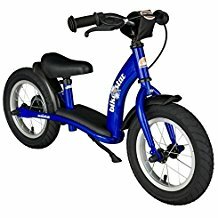 How much do balance bikes cost? There are balance bikes to fit every budget, with the best value bikes such as the Chicco Red Bullet balance bike and the Boppi balance bikes available for around £30. Although these bikes do not have a huge range of features, they look good and will give your child the opportunity to enjoy riding. If you can stretch your budget to around £50 - £60, then bikes such as Bike Star, Puky and Strider balance bikes are available. Some bikes cost around £100, and top of the range models such as the Early Rider Alley Runner are closer to £150. Once you have decided on the best balance bike, then there is a whole range of accessories available to compliment your child’s ride. One essential purchase is a kids bike helmet, and other gadgets include bells, carry bags and gloves to protect the hands and provide extra grip. Strider are market leaders in balance bikes, and the Strider 12 Classic gets our vote as one of the most versatile and best quality bikes around. One of the main selling points is the fully adjustable saddle height, and the minimum height of just 28cm means that it is suitable for the youngest riders from just 18 months old. The seat can be adjusted right up to 40cm, so this means it will grow with your child as they become confident on a bike. Other features include a classy design, EVA puncture proof tyres and it is also very lightweight at just 2.9kg. 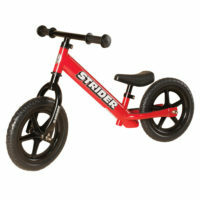 You really can’t go wrong with the Strider Classic balance bike for around £60. 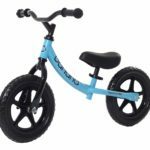 This stylish looking balance bike has the notable feature of a low platform or footboard, so it is ideal for balance bike beginners. This allows the child to rest their feet as they scoot along, and is a similar feature to that found on the Puky LRM Learner bike. This is a good quality bike with a number of other features such as a brake and a kickstand. 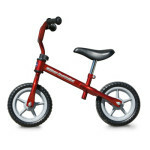 It costs around £65 and is a good choice as one of the best balance bike for 2 year olds or for 3 year olds. Balance bikes really are accessible to people on all budgets, with superb bikes like the Chicco Red Bullet Balance bike available for under £30. This is one of the smallest bikes on the market, weighing in at just 2.7kg so this means that it is perfect for younger children age between 2 and 3 who are just learning to ride. This is a great age to buy a balance bike, and you can check out our guide to best balance bikes for 2 year olds. The red metallic frame gives stylish appearance, and the seat height starts at 32cm. 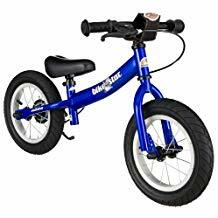 A great value balance bike will get your child in the saddle! Puky have a great range of balance bikes so it is difficult to focus on just one of their models. The Puky LRM Balance bike is perfect for 2 year olds with a step through frame, a special learner bike saddle and safety handlebars. 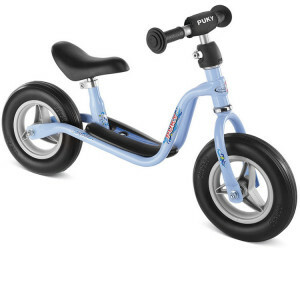 The next model up is the Puky LR1L Learner bike, and although this is slightly more expensive this is a direct competitor for the Strider Classic although features a low platform and pneumatic tyres. There is also a kick stand to stop the bike being thrown on the floor so much! All of the models mentioned above comprise a steel or metal frame, but there is also a great range of wooden balance bikes available! 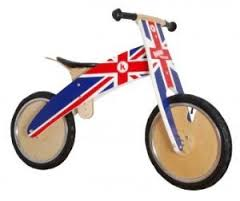 One of the advantages of wooden balance bikes is that they can be painted in all sorts of funky designs and colours. We love the fantastic Kiddimoto Kurve range which is available in designs including Union Jack (pictured), Police, Fire and Pastel Dotty. Now that you have seen the options and reviewed our top picks for the best balance bike on the market, its up to you to pick what meets your needs, is in your price range, and overall help your child get on their bike. As you know, new bikes are being launched all the time so we will try to keep you up to date with the latest models. Or if you feel like we missed a superior bike that needs to be included on the list, then please let us know.